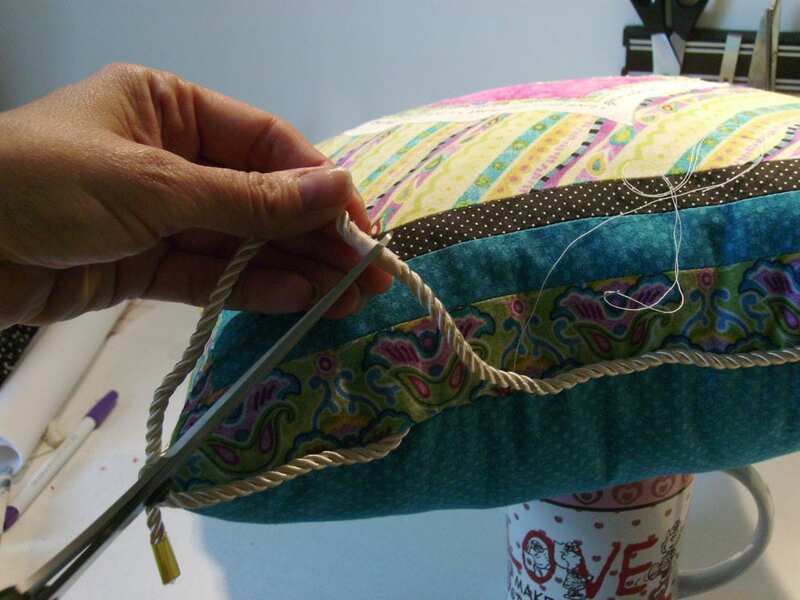 In this easy pillow tutorial, I’ll show you how to make your own bias covered cording. Bias covered cording is SO much easier than most people think, and it’s really not scary at all! 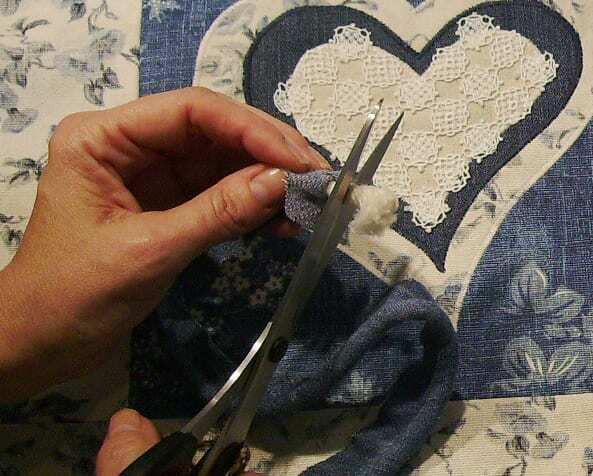 Making your own DIY cording allows you to use matching or coordinating fabric to create the perfect accent. 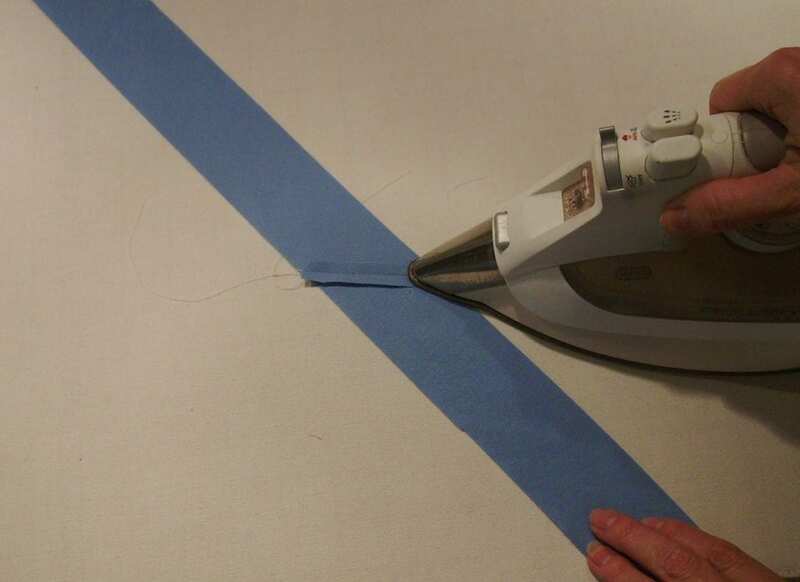 Simply cut the bias strips, fold them around cord filler and stitch. 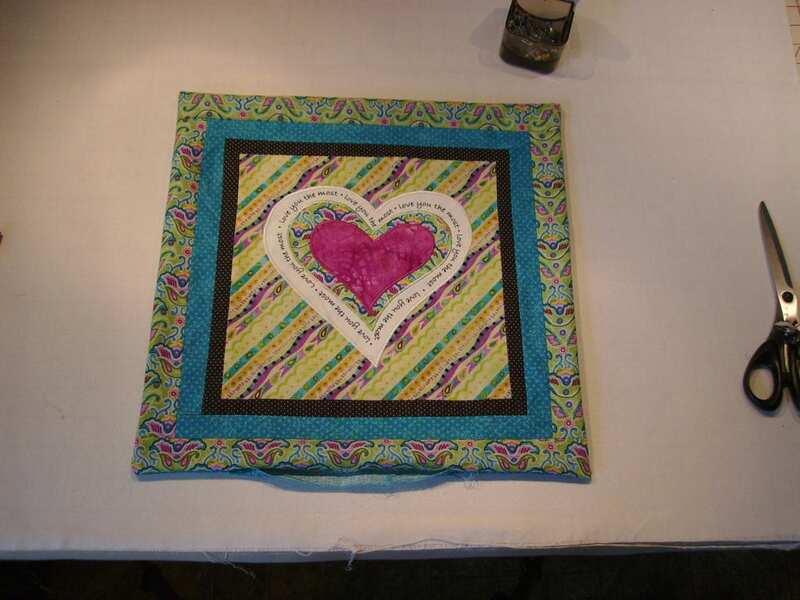 For a 14″x14″ pillow you will need about 64″ of bias strips, so you’ll need about 5/8 yard of 42″ wide fabric and 1 7/8 yd of 3/8″ cotton piping filler cord. 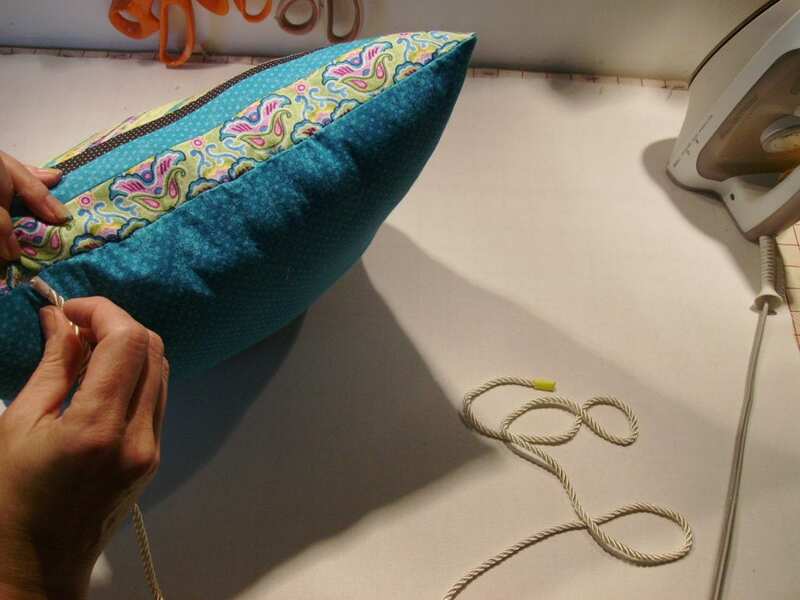 Follow the steps below to make covered cord and add it to a pillow top. 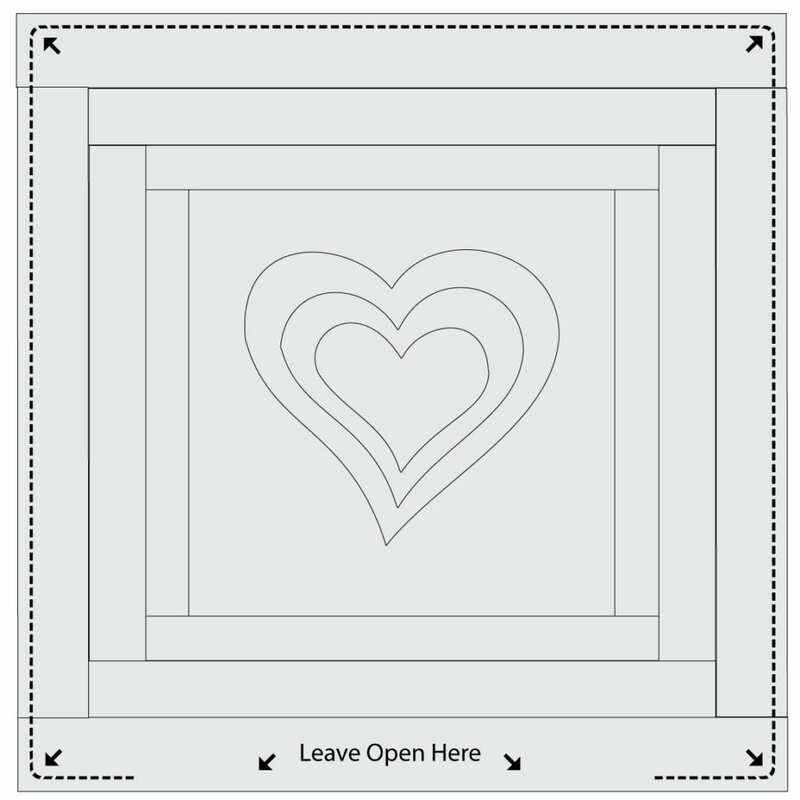 Add custom covered cord to any project – just measure around the piece and visit one of the many guides available online to calculate the yardage you need. Here’s one I like! 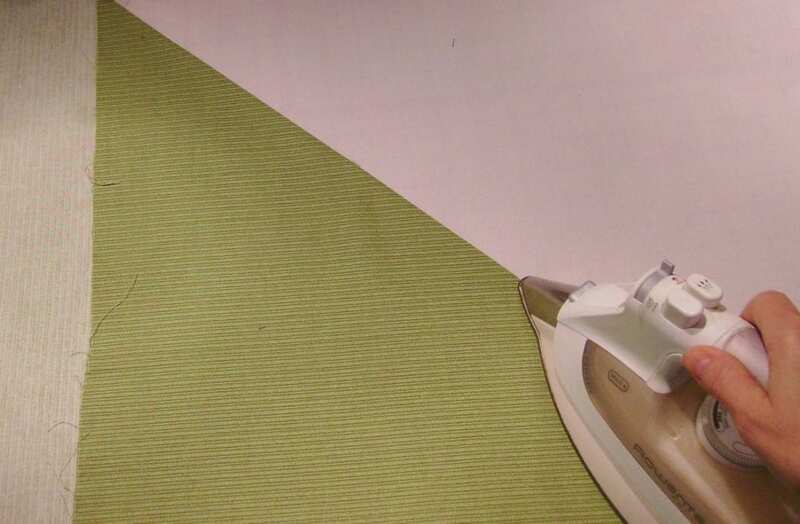 Press along the diagonal fold to crease the fabric. 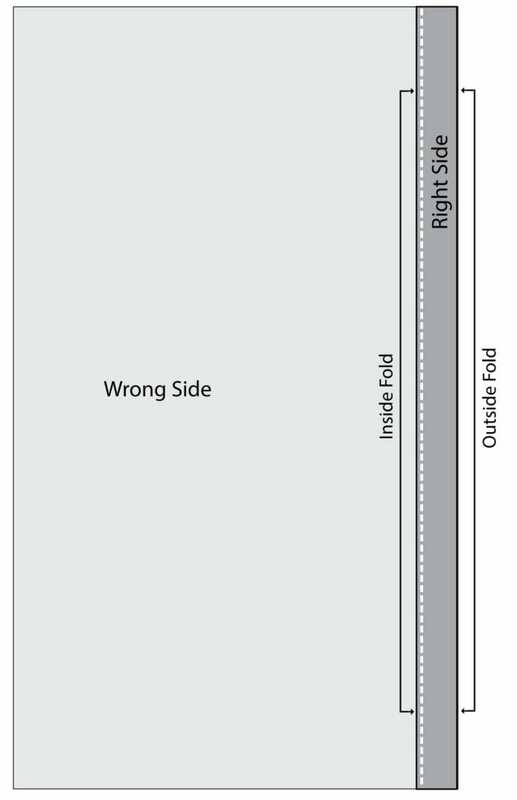 This provides a guide line for cutting your strips. 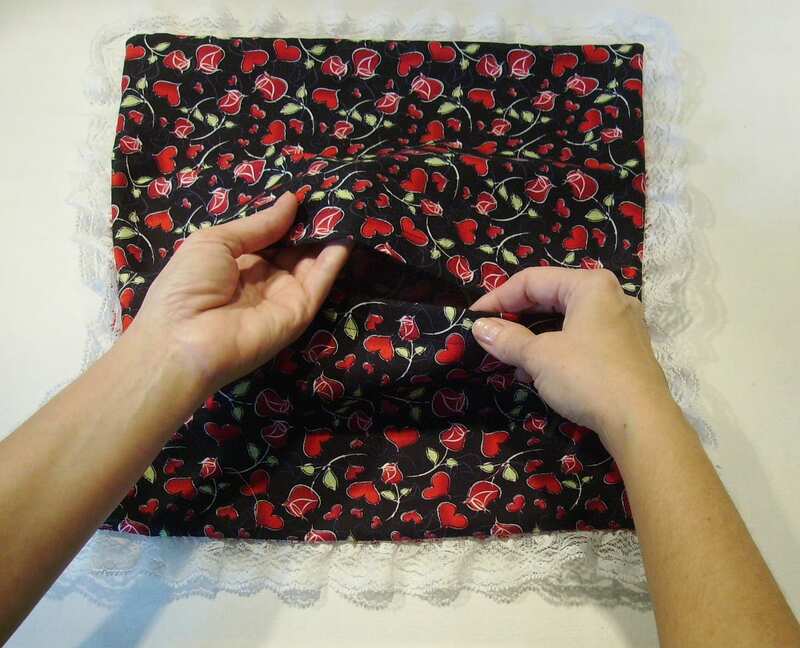 Open up fabric to see the ironed crease. I’ve marked it here to make it easier for you to see. 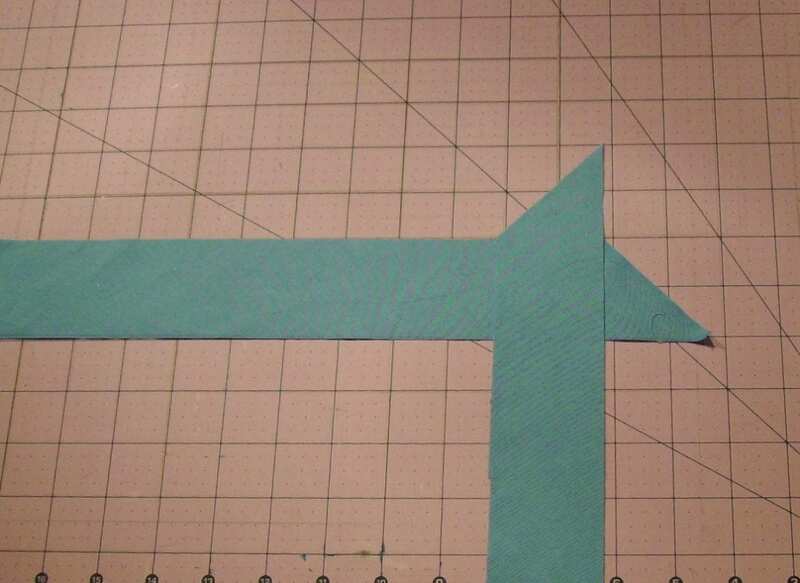 Stitch the two strips together at a 45° angle to make the seam “disappear”. 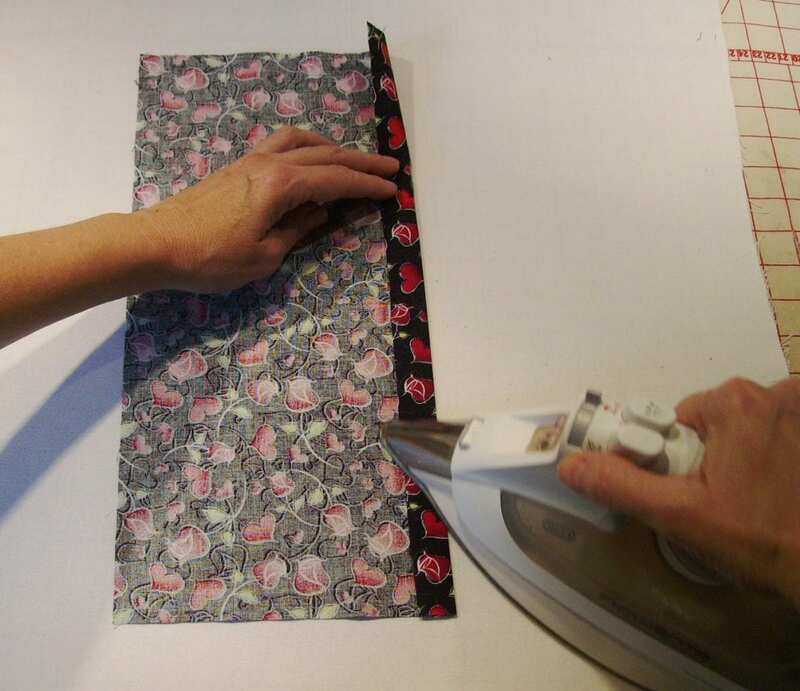 Lay one strip on surface, right side up. 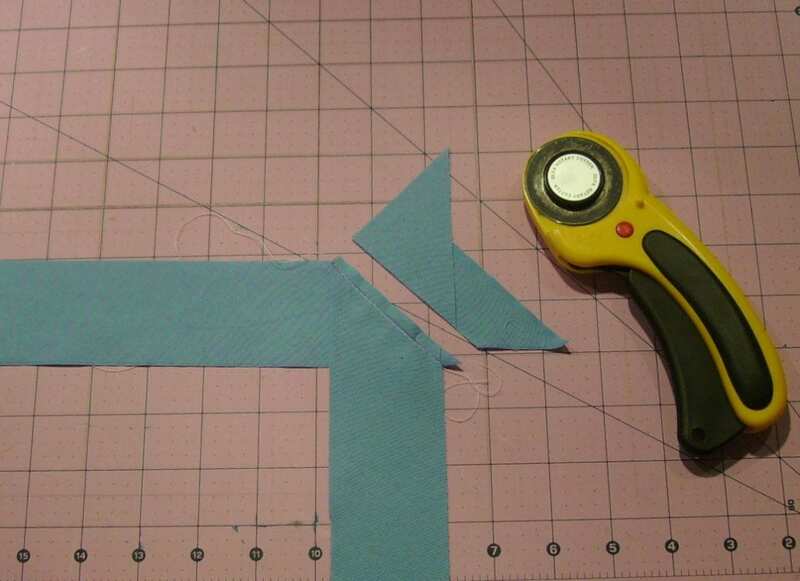 Lay second strip on top at a right angle, right side down. 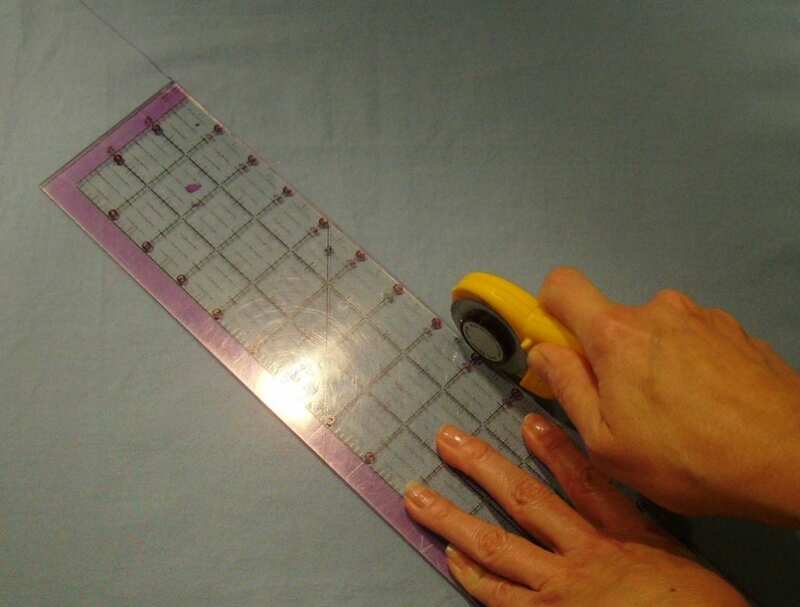 Use a ruler to mark a 45° line from corner to corner. 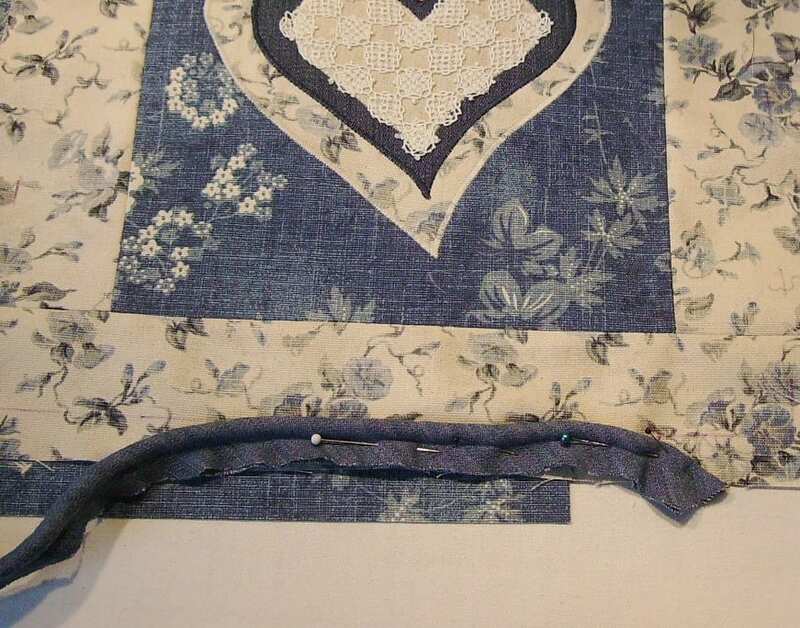 Pin and stitch strips together along the marked line, using a straight stitch. Center cord filler on top of strip. 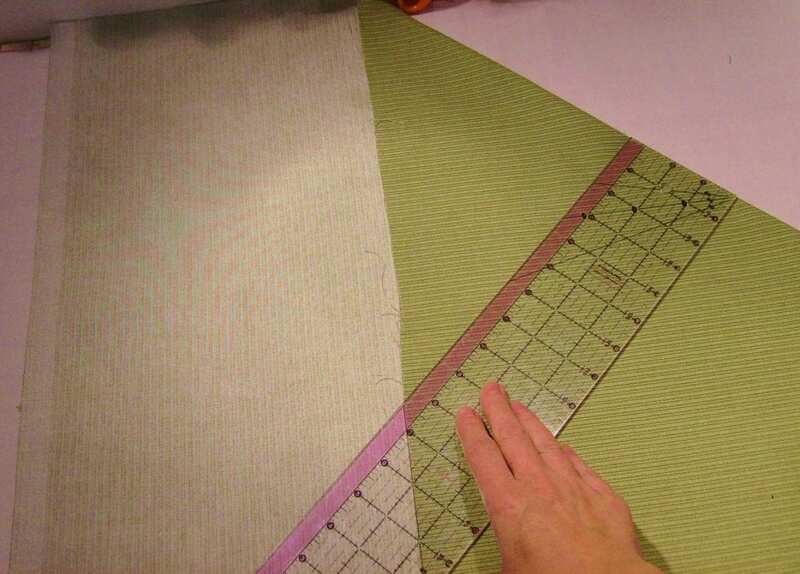 Fold strip over firmly, matching raw edges. Pin in place. 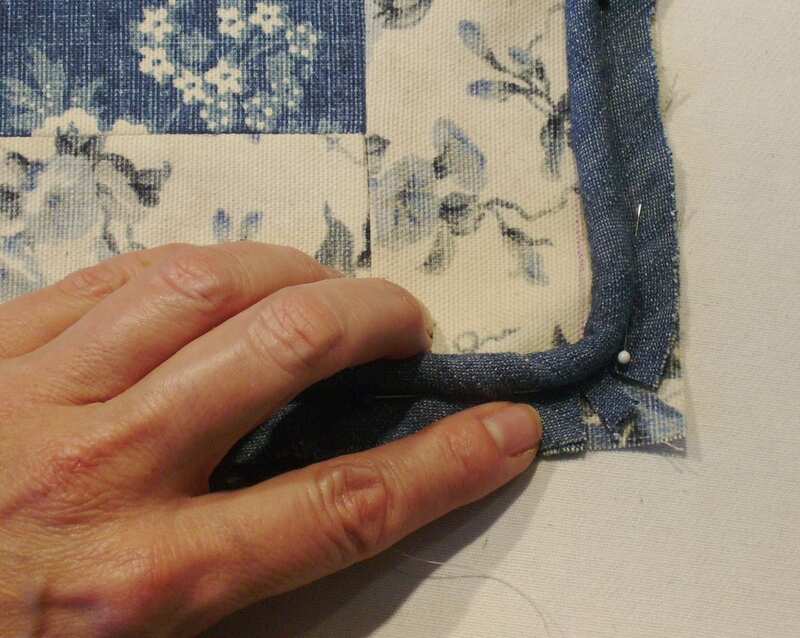 Stitch close to cord filler using a zipper foot and straight stitch, being careful not to catch cord filler. You’ve just made custom bias cording! Lay pillow top face up on work surface. 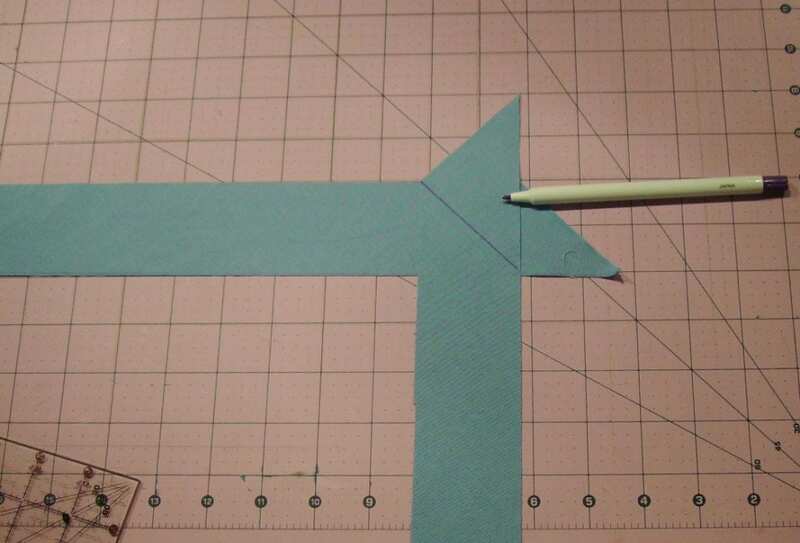 To reduce bulk at seam line, pull back bias strip at starting edge. 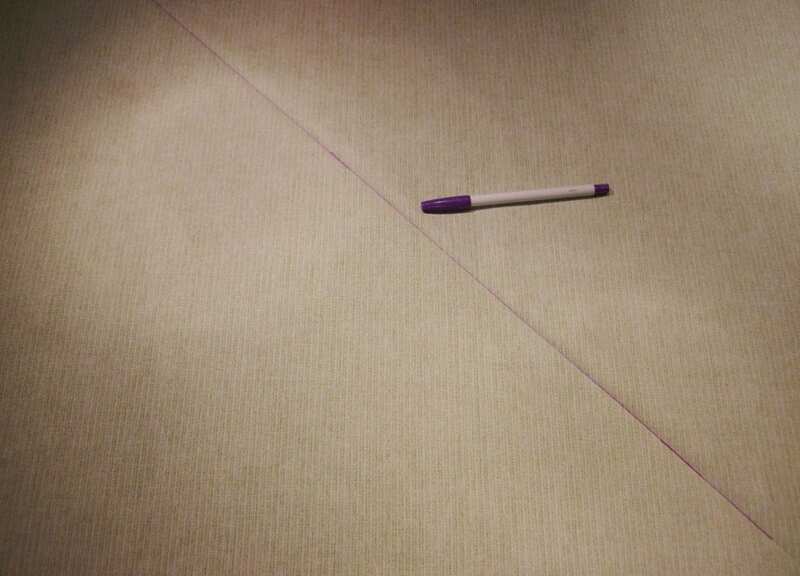 Cut about 1″ off the end of cord filler.Pull bias strip back over, creating a flattened section at starting edge. 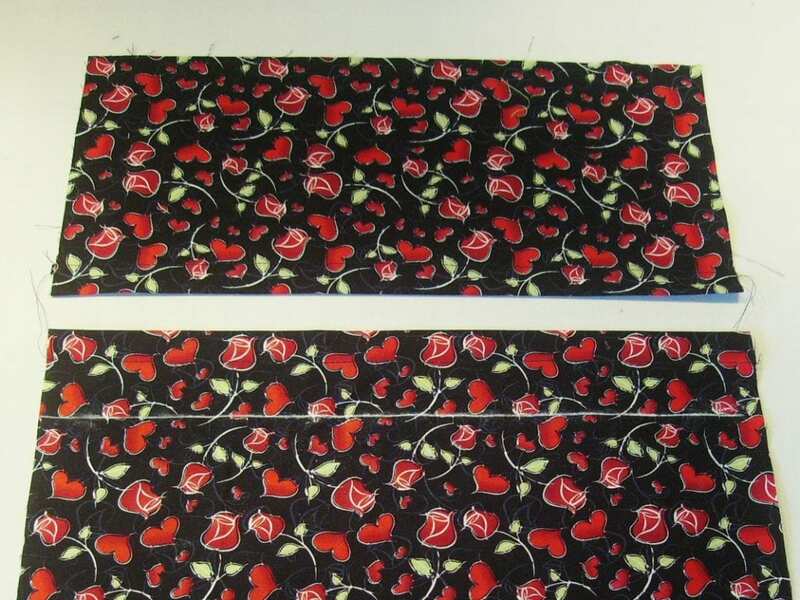 Pull bias strip back over, creating a flattened section at starting edge. 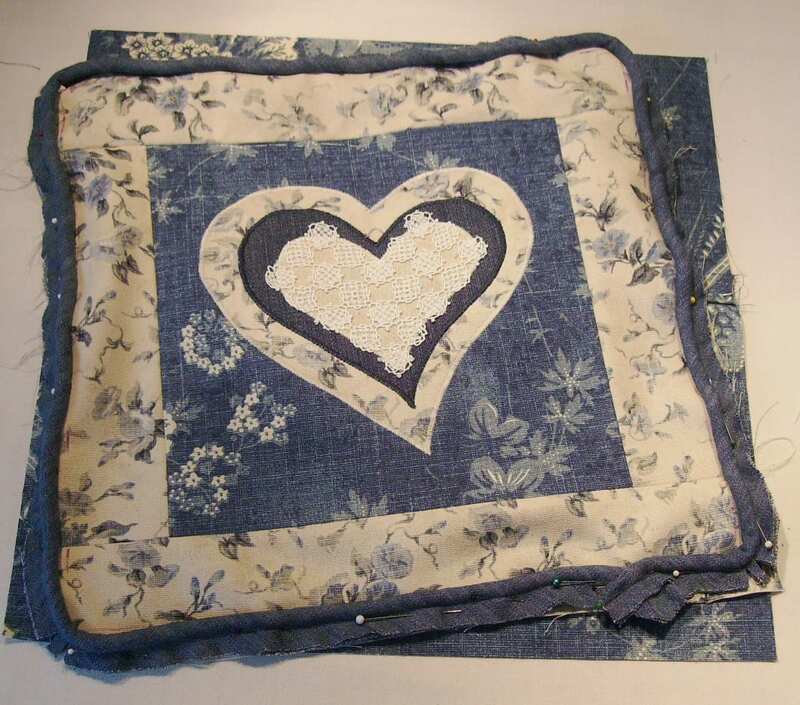 Pin covered cord to pillow top, raw edge to the outside, corded edge to the inside. Pin in place. Leave about 1 1/2” free at starting edge. 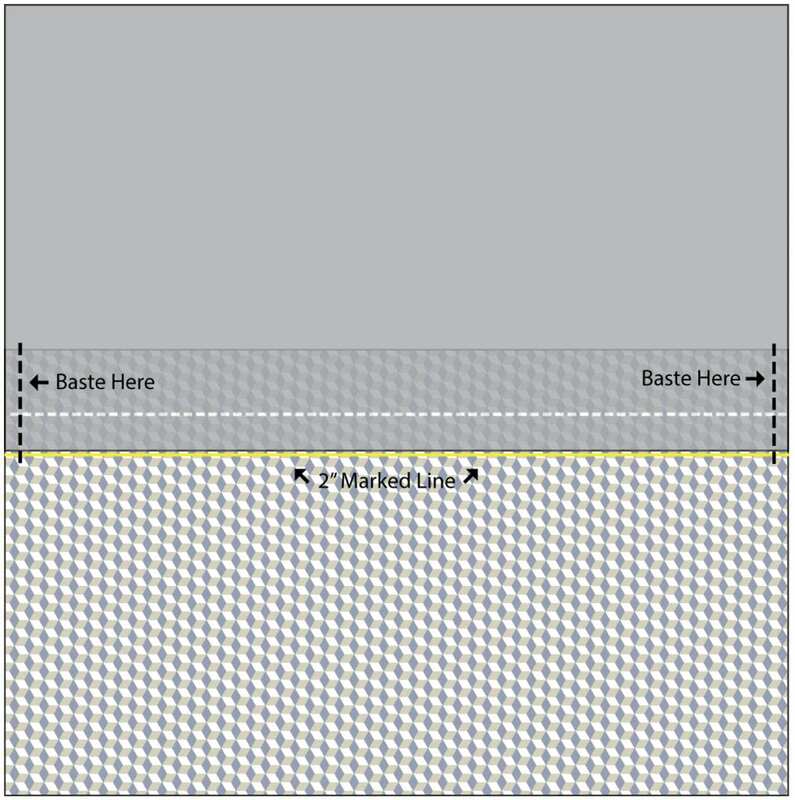 Align starting edge with raw edge of pillow top. 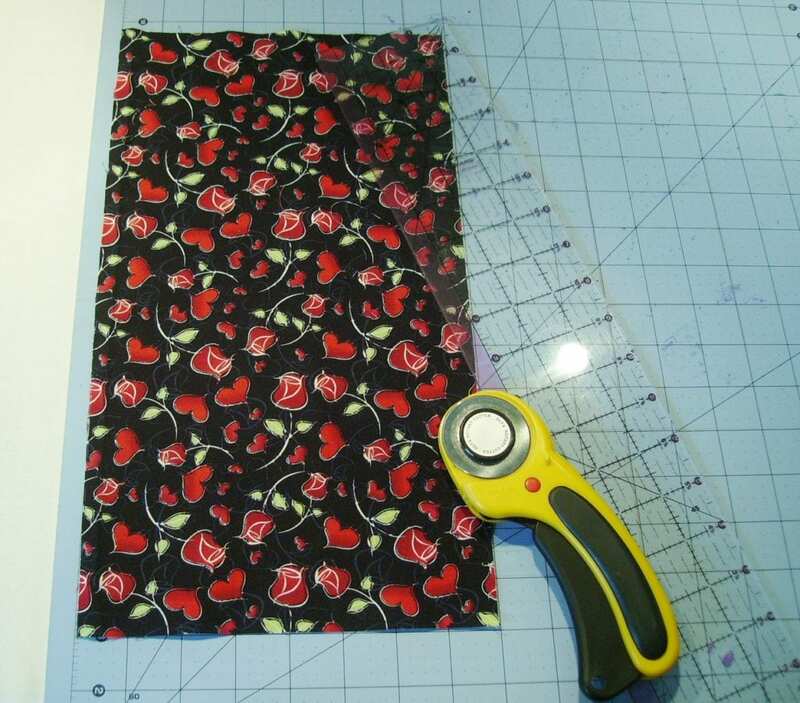 Clip into bias binding at each corner to help cording lay flat and curve sweetly around the corners, being careful not to clip into your stitching. 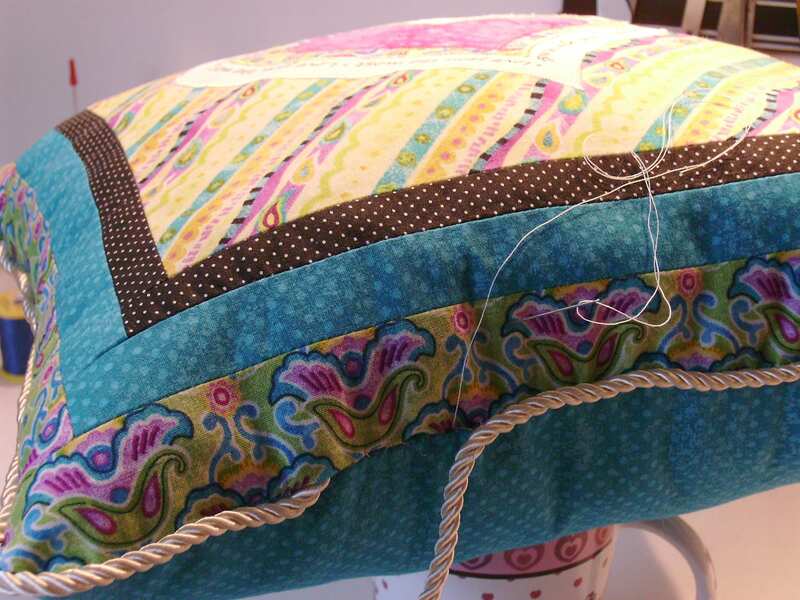 Continue pinning cord to pillow top, leaving about 1 1/2″ at end point. 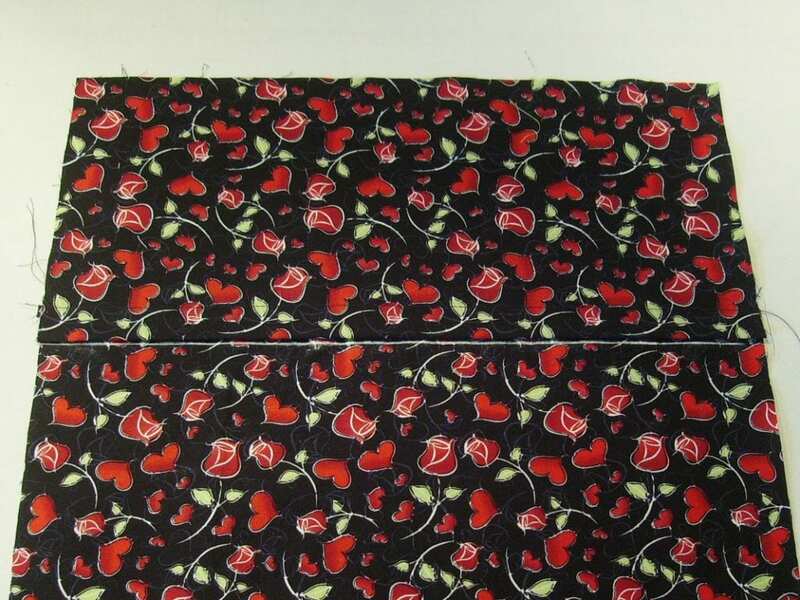 Stitch close to cord filler using straight stitch and zipper foot. 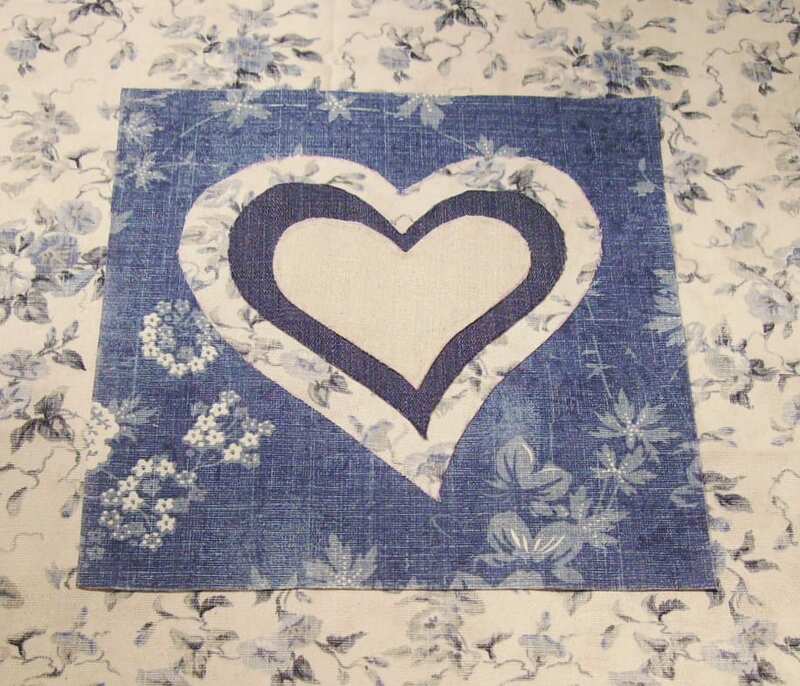 Create a simple, one-piece back pillow using the pillow top, or learn how to make an envelope-back pillow here. 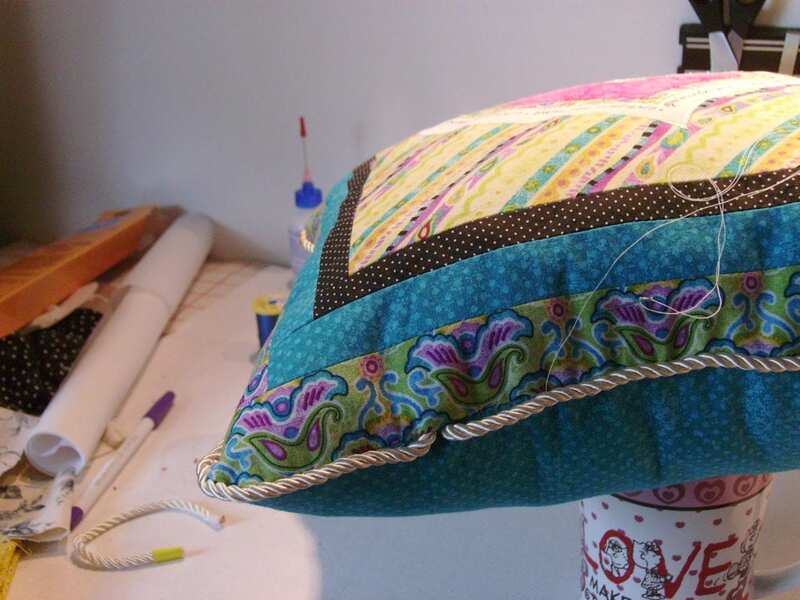 I hope this pillow tutorial eased your mind about making bias covered cord! 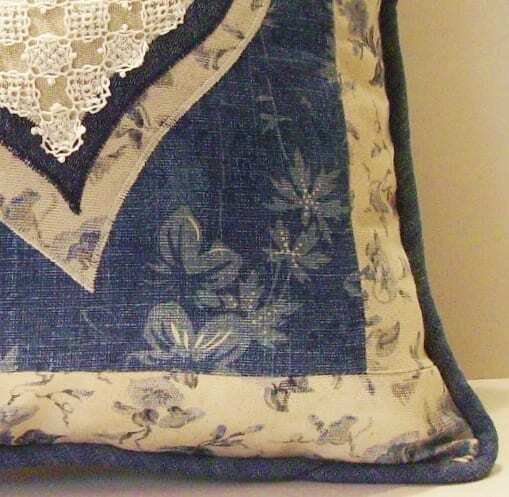 Now that you know how easy it is, add this custom finishing touch to all of your pillow projects.